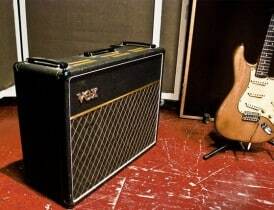 The Vox AC30 is one of the longest-lasting and most popular guitar amplifiers ever produced. Its appeal is wide enough that it could be considered to be the Fender Twin of Europe and it has powered as many legendary recordings as Leo’s finest or anything Jim Marshall ever created. Used by artists ranging from The Beatles to Brad Paisley, the AC30 is one of the primordial flavors of guitar amplifiers and is likely to be in use as long as anyone out there has some interest in the electric guitar. Originally brought to market in 1958, the AC30 was considered a big brother to the Vox Company’s up-til-then flagship amp, the AC15. Also called the AC30/4, it featured one 12-inch Goodmans 60-watt speaker and two channels with two inputs each, which explains the “4” in the model designation. It used EL34 power tubes, a tube rectifier, and EF86 preamp tubes, which were known to fail from vibration fairly often. These early AC30s lived in “TV Front” cabinets, reminiscent of some 50’s Fender amps, and were covered in thin, white Rexine with a small diamond pattern and grill cloth with a larger diamond imprint. The EL34 tube was not used for very long and soon the amp came with EL84 power tubes. 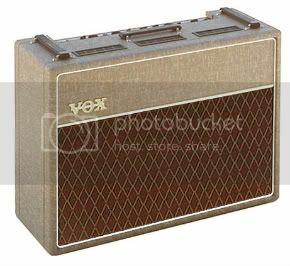 It was still a 1×12 but Vox shortly introduced the AC30 Twin, which came with two Goodmans Audiom 60 12-inch speakers. Later models shipped with Celestion G12 alnico drivers. The 2×12 configuration helped the amp move more air on bigger stages, which was an important consideration at the time. In 1960, Vox abandoned the “TV Front” cabinet and debuted the cabinet design that has remained mostly unchanged from then until today. These new cabs were covered in fawn Rexine, which was a beige leather-ish cloth that featured a subtle printed grain pattern. The front baffle now came divided by a thin gold strip which separated the Rexine-covered top section from the new brown diamond grill cloth below. The top of the new cabinet also sported three small brass vents to provide airflow to the tubes, as well as three leather straps to assist in transport. In 1961, Vox changed the unreliable EF86 tube to the better ECC83 (12AX7) preamp tube and the circuit to a three channel/six input design with Normal, Brilliant, and Bass voicings called the AC30/6. Around this period, the Top Boost feature came into being and consisted of a rear-mounted circuit that gave the amp an extra gain stage as well as individual control for Bass and Treble, which was an improvement over the single tone knob found on previous models. The Top Boost became so popular that it was soon part of the new AC30/6 and its controls were made part of the main control panel and amps from this 1963-ish period had the Top Boost on board and became known as AC30TBs. Vox also brought out the Treble and Bass versions of the AC30 without the Top Boost which used changes in the circuit design to emphasize these frequencies. The late 1960’s saw Vox in varying amounts of financial distress, which led to ownership changes and the inevitable drop in quality control that these sorts of situations typically bring about. The 1970’s saw more changes to the AC30, including a silicon rectifiers and a solid-state model, the AC30SS. A new tube-powered AC30 with reverb was brought back in 1978. AC30 production has never stopped, despite a 1991 “Limited Edition” run and newer AC30s are reissues of the AC30/6 (AC30TB) originals. Production, which was always in Great Britain, has been moved to China, which has made some Vox fans unhappy, but at least the amp can still be obtained. Whether you plug into a vintage model or one of the newer amps, the Vox AC30 will give you the jangly, chimey, sound that has kept it on stages both large and small since its inception. If you have never played one you need to and if you have played one, you probably own one. The AC30 is one of rock’s most important sounds and deserves a place in any serious amp collection.